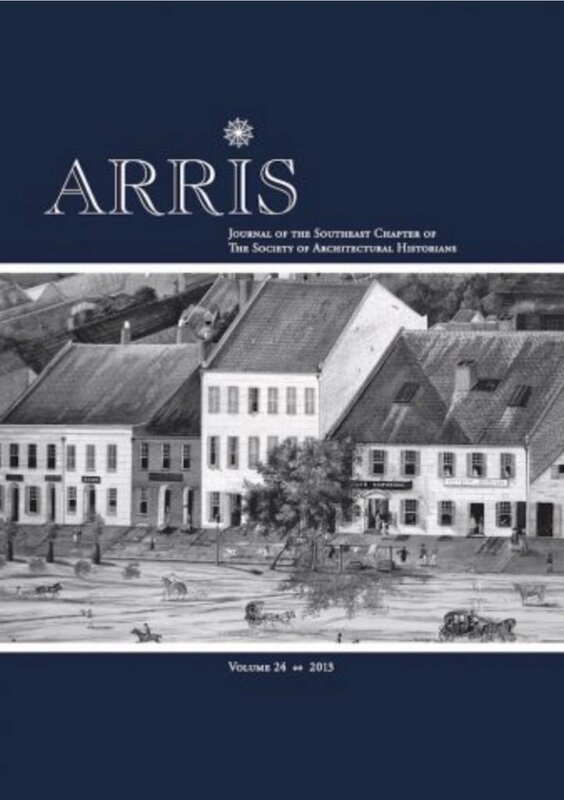 The Southeast Chapter of the Society of Architectural Historians (SESAH) is seeking nominations for a co-editor or editorial team for volume 30 of its award- winning academic journal, Arris, to be published in 2019. The co-editor and book reviews editor will work with current co-editor Alfred Willis for a one-year appointment, with the option of being elected to three-year terms for Volumes 31- 33 (2019-2021). Editors serve as voting members of the SESAH board of directors. Arris is published annually as a peer-reviewed print journal. Significant attention is paid to the physical appearance of the journal, which features abundant black- and-white illustrations and high-quality paper.The journal is available in hardcopy for members and membership institutions and indexed in the Avery Index to Architectural Periodicals and EBSCO’s Art and Architecture Source. Pdfs of back issues are available from the SESAH archives housed at Georgia Tech. Limited free-access digital copies of past issues are available at sesah.org/archived-arris-issues/. A call for papers has already been issued for Arris’ Volume 30. The Arris editors will therefore oversee all aspects of publication, including vetting submissions via a peer-review process; preparing manuscripts for publication by working closely with authors; providing authors with guidance on securing image permissions; coordinating copyediting and page proofs; and arranging with the book review editor for the timely submission and editing of book reviews. The editors will work with the SESAH membership coordinator/treasurer in distribution of the print journal to members and membership institutions. Ideal candidates will have a strong record of previous publications; a history of involvement with SESAH; editorial experience; and a keen interest in collaborating with other scholars. The candidates may come from any of the SESAHs constituencies in academia, historic preservation, museum work, archival work, or independent scholarship. Institutional affiliation is a plus, but not required. Institutional support – from the candidate’s academic institution or professional organization – would be of great benefit, including funding to support travel to conferences (to solicit contributions to the journal), funding for editorial assistants (such as graduate research assistants), and flex time to facilitate editorial work. The candidates should not be serving on the editorial board of a competitive journal. Once elected, the editors may not publish their own work inArris during the term of service. Nominations (including self-nominations) should be sent to Vandana Baweja at vbaweja@ufl.edu and Jennifer Baughn at jbaughn@mdah.ms.gov by February 28, 2019 with the subject line Arris 30 Editor 2019. Nominators should ascertain their nominee’s willingness to serve before submitting a name and should include an explanation of the nominee’s qualifications for appointment. Self-nominations should include a CV and a cover letter explaining qualifications. Inquiries and questions are also welcome. For more information about SESAH visit www.sesah.org.